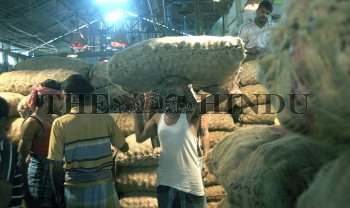 Caption : Kolkata: The wholesale onion market is going dull for last few days, as the local inflow of onion has been increased for last one week and prices have come down Rs.30 to Rs.50 per quintal. The demand of imported varieties have also come down for the plenty of local production. The traders are expecting a further drop in prices is likely in the coming weeks. Photo: Arunangsu Roy Chowdhury March 17, 2009.